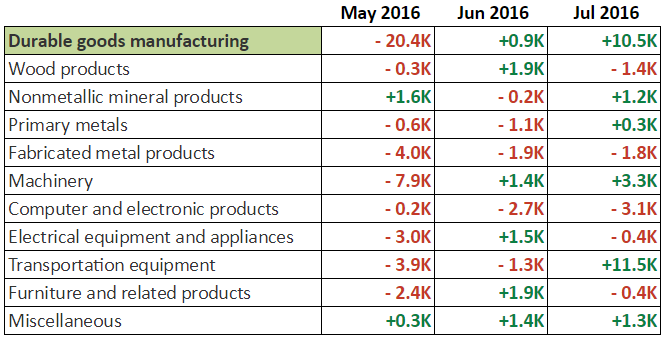 The July NFP report was pretty good on the surface, which is why the Greenback rallied hard. But what about the details? Are they also sending out good vibes for the U.S. economy? Well, read on and find out! In my Forex Preview for the July NFP report, I concluded that “the available leading indicators are saying that payroll numbers in July still grew, albeit at a weaker pace when compared to June.” I also wrote that “The consensus reading therefore looks about right. However, probability seems slightly skewed towards a downside surprise.” Well, we got an upside surprise instead. Non-farm employment in July increased by 255K, which is much more than the expected 180K. Even better, July’s strong jobs gain of 287K was upgraded to 292K. Also, May’s very dismal 11K reading was revised higher to a less dismal 24K. 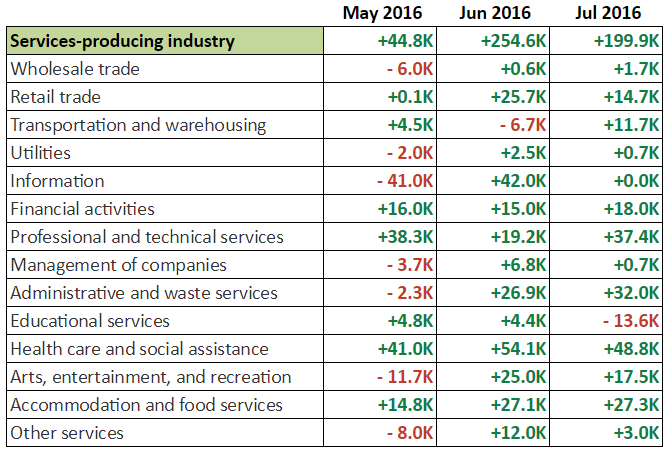 Looking at the details of the report, the service sector was still the main generator of jobs. However, as the PMI readings hinted at, jobs creation from the service sector moderated a bit, which is why the net gain in employment for July was less when compared to last time. Construction did finally see an increase in employment after several months of jobs shedding. This was able to partially offset the weaker contribution from the service sector and is also a good sign for the housing market. I told y’all in my Forex Preview that “If employment does come in at 100K or better, then forex traders will usually focus on other labor indicators, namely wage growth.” Well, there was no problem on that end. Heck the actual monthly reading even came in at 0.3%, beating expectations of a 0.2% increase. The annual reading, meanwhile, came in at 2.7%, which is the fastest pace of increase in over a year. Looking at the tables above, the relatively higher-paying transportation equipment industry (aerospace engineers, mechanical engineers, machinists, etc.) generated most of the manufacturing jobs. As for the service sector, lower-paying industries like retail, accommodation and food services, and administrative and waste services continued to provide a large chunk of jobs. But on the bright side, the higher-paying professional and technical services industry (accountants, lawyers, architects, etc.) also contributed a solid chunk to job creation. The higher-paying financial industry also continued to steadily provide jobs. The median-paying health care and social assistance industry, meanwhile, also continues to provide a lot of jobs. The relatively strong jobs gains from several higher-paying industries and the median-paying health care and social assistance industry is likely one of the reasons why wages grew at a faster-than-expected pace. The jobless rate failed to tick lower from 4.9% to 4.8% as expected. But on a more upbeat note, the participation rate did tick higher to 62.8%. This is the second consecutive month that the participation rate has been increasing, which could be a sign Americans are getting encouraged enough to join or rejoin the labor forces. Looking at the details, the civilian labor force expanded from 253,397K to 253,620K. But at the same time, the number of unemployed people slid from 7,783K to 7.770K. This means that while the jobless rate held steady, it’s still a good sign, since the U.S. economy was able to absorb the influx of workers who joined or rejoined the labor force. 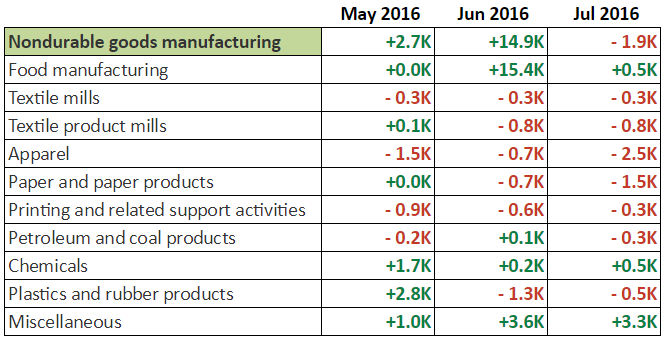 Overall, the July NFP report was pretty solid all around. And as I said in my Forex Preview, “if the upcoming NFP report is solid all around, it may just revive rate hike expectations, which may stoke Greenback demand.” And that’s exactly what happened here. 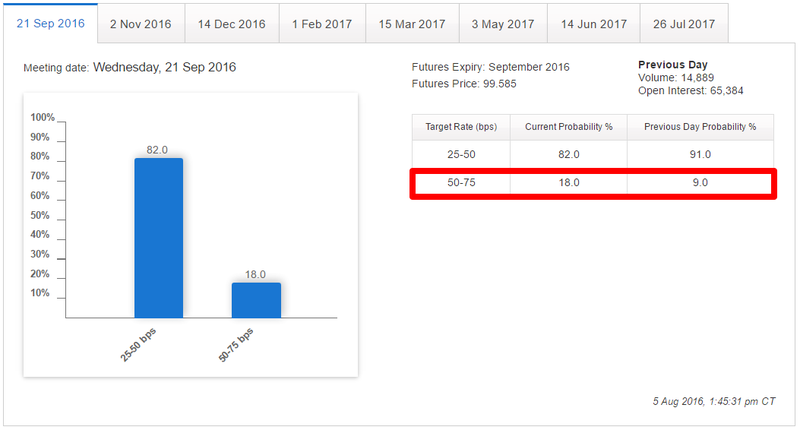 If we look at the CME Group’s FedWatch Tool, we can see that the NFP report was enough to push the probability of a September rate hike higher from just 9% to 18%. As for the Greenback selling when the session was about to close, that was likely due to profit-taking in order to avoid weekend risk. Although it could also be due to other details of the NFP report, namely the seasonally unadjusted readings. If we look at the unadjusted readings, non-farm payrolls actually declined by 1,030K jobs from 145,215K in June to 144,185 in July, which is starkly different from the seasonally adjusted reading of +255K. Most of the losses were government jobs, though. If only private payrolls are taken into account, then non-farm employment only increased by 85K from 123,177K to 123,262K. In contrast the seasonally adjusted reading for private non-farm payrolls reported a 217K increase. This seasonality issue has been something that many forex traders have been thinking about recently after the BEA revealed that it may have found some flaws in its calculations for computing the seasonally adjusted GDP readings. This flaw has caused lots of revisions for GDP readings as far back as 2013 and maybe even beyond, as I noted in my Review of the Advanced Q2 U.S. GDP Report. And it’s possible that forex traders are also considering that the same flaw may have afflicted the NFP report, although the BLS, a different agency, is responsible for compiling the NFP report. I guess we’ll know what the market finally thinks about the NFP report in next week’s price action for the U.S. dollar.